Six Degrees of Kevin Bacon may be the name of the game but it takes less than that to connect any two users on Facebook. According to a study by Facebook and the University of Milan, the average number of steps it takes to link any two individuals on the social network is 4.74. In a blog post late Monday, Facebook's Data Team said the researchers had used state-of-the-art algorithms to approximate the number of "hops" between all pairs of individuals on Facebook. "We found that the degrees of separation between any two Facebook users is smaller than the commonly cited six degrees, and has been shrinking over the past three years as Facebook has grown," they said. "Six degrees actually overstates the number of links between typical pairs of users. "While 99.6 percent of all pairs of users are connected by paths with five degrees (six hops), 92 percent are connected by only four degrees (five hops). "And as Facebook has grown over the years, representing an ever larger fraction of the global population, it has become steadily more connected," they said. "The average distance in 2008 was 5.28 hops, while now it is 4.74." "Thus, when considering even the most distant Facebook user in the Siberian tundra or the Peruvian rainforest, a friend of your friend probably knows a friend of their friend," they said. The researchers said that when focusing on a single country, most pairs of people are separated by only three degrees, or four hops, and the vast majority of connections span only a short distance. "We found that 84 percent of all connections are between users in the same country," they said. 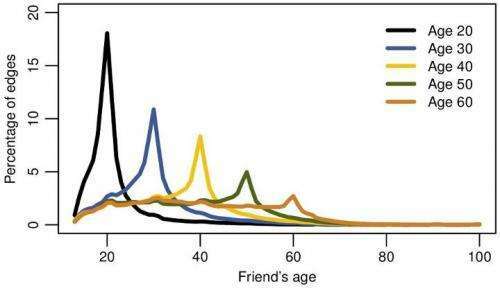 For the study done earlier this year, the researchers examined 721 million active Facebook users -- a figure that represents more than 10 percent of the global population -- and the 69 billion friendships among them. The notion of six degrees of separation between any two people stems from a 1929 short story, "Chains," by Hungarian author Frigyes Karinthy and research performed in in the 1960s by American social psychologist Stanley Milgram. The phrase gained further currency with the 1990 play "Six Degrees of Separation" by American playwright John Guare. More recently, it has been the name of the game Six Degrees of Kevin Bacon, in which players try to connect Hollywood actors to the "Footloose" star in the shortest number of steps. I'm not too sure I even want to be this close to Kevin Bacon..
let's not call them all "friends"
Sure, the 6.5 billion people who don't have facebook accounts don't matter. "Our" degree of separation is what shows up on facebook. Silly. Does that make it irrelevant? 500 million people is a damn good sample size and I, for one, have met and talked to most of the people on my friends list in person. I'd be hard pressed to say that's not the least bit applicable for the other 499,999,999 and I'm a rare exception.